PARIS (AP) — Enable held off a late charge from Sea Of Class to successfully defend her crown at the Prix de l’Arc de Triomphe by a neck on Sunday with Frankie Dettori riding his record sixth winner in Europe’s richest race. Trained by John Gosden, the four-year-old filly was a heavy favorite to become the eighth two-time winner of the Arc. Enable was always traveling strongly at Longchamp on the heels of the leaders and the packed grandstands roared as she hit the front. Sea Of Class rattled home once in the clear to set up an epic finish, but Enable had just enough to claim a popular victory in Europe’s premier middle-distance race. Cloth Of Stars was third. 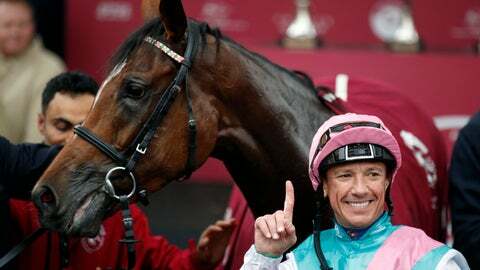 Dettori also won the race with Enable at Chantilly last season, adding to the Italian’s previous triumphs aboard Lammtarra (1995), Sakhee (2001), Marienbard (2002) and Golden Horn (2015). Having missed much of the season through injury, Enable had endured a far from ideal preparation for her Arc defense. Dettori was riding in the race for the 30th time.